Last week, after literally thousands of dives in drysuits, I decided to buy myself a little something for my birthday; dry gloves. Specifically, I bought DUI Zip Gloves in the standard, heavy duty (blue) version. I know DUI was/is changing to black, so mine may have been hanging around the shop a while, but I don’t think so. Nevertheless, I got them into the water the very next day, while taking PADI Open Water students into Lake Tahoe for their first open water dives. First Impression I can’t believe I didn’t switch to dry gloves years ago. Then again, my drysuit (DUI CF200x) was made before ZIP Seals were available, and dry gloves with standard wrist seals are a different beast. Zip Seals are absolutely one of the coolest things in the world. I had my suit converted to Zip Seals by DUI last year when I needed the zipper replaced. Back to the gloves. Once I got them home, I went about the business of attaching them to the suit. The recommendation is to run the inner seam of the drysuit sleeve about center on the Zip Glove’s palm. I have been twisting my wrist seal around for years into a position that doesn’t put an annoying twist in my sleeve underwater, so I knew that centering the seam wasn’t going to be right. Instead I just held each sleeve in the position I know rides naturally in the water without a twist, and attached the glove with the thumb on top relative to that. The position turned out to be exactly right. My concern all along with dry gloves was that I’d lose too much of my sense of touch. In reality, that isn’t the case at all. I have been using 5mm neoprene gloves (Fourth Element, and they’re awesome!) for a long time, so I haven’t had much sensitivity anyway. With DUI Zip Gloves, I found that I actually could feel things, and manipulate objects better than with the wet gloves. That may be in part due to my hands being SO MUCH WARMER, but either way, it’s not a factor. Of course warmth is the key. Lake Tahoe was 48 degrees on the surface. Not Arctic, but no tropical paradise by any stretch. Entering the water with your hands remaining dry and cocooned in the fuzzy warmth of the liner is heavenly. Getting into your drysuit with DUI Zip Gloves Another concern I had was getting into the suit and being able to get my neck seal to lay flat. I’d heard that was an issue. 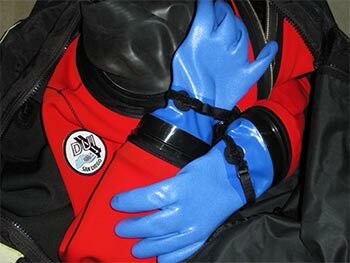 The standard procedure is to get half into the Drysuit like always, then put on a glove liner and pull on the sleeve. Repeat with the other side, then onto the neck seal as always. I found that adjusting the neck seal with dry gloves on is a bit fidgety; mostly because the glove and the seal have bit of a tendency to stick together. And, you can’t feel crap compared to your bare hands. My solution, since I have a front entry drysuit, was to put on my left arm, then go straight to the neck seal. That way, I have a bare right hand to reach up and under the seal to make sure my undies aren’t trapped anywhere, and also, fingers to run around my neck to make sure it’s laying properly against my neck. The trick is to be enough of a contortionist to get your right sleeve on with the neck seal in place. I can do it with very little resistance. My guess is that, that won’t work for everyone. It definitely won’t work with a back-entry drysuit. Zip Glove Comfort DUI Zip Gloves eliminate anything from constricting around your wrist. It was half an hour after the first dive that I even realized I’d been wearing my watch under the suit. It feels so good not to have that seal, I don’t even know how to describe it. To keep the glove from “puffing” up, there’s a thin Velcro strap that takes up the slack. It does the job perfectly, without the least bit of restriction. So, by now you’ve no doubt realized that I am a huge fan of DUI Dry Gloves. I guess there may be those who feel differently, but especially for very cold water, I never want to dive with wet hands again. Give them a try. I’m pretty sure you’ll agree that it’s the best money you ever spent. This entry was posted in New Dive Gear, SCUBA Gear Reviews, SCUBA Instruction, Technical Diving and tagged diving equipment, diving safety, JoeScuba, tec gear, tech gear, technical diving, wreck diving.